If you ask Isaac how old he is, he'll say "two" and hold up two fingers. The reality is that he'll be two in about 2.5 weeks, but Isaac is pretty sure he's already there. There's really nothing about our guy that is still one-year-old. He has discovered letters and loves to sing his ABCs. He can dance like it's no one's business. He gives the best hugs. Really. The best. He has the most deliciously squishy cheeks. They must be kissed many times a day. I broke out our winter pajamas today and was so excited to see the cute 2T footie jammies that Noah used to wear. After showers, Matt tried to squeeze Isaac into the jammies. He squeezed and sqeezed and barely got Isaac in. Barely. A few minutes later, I noticed that the seams were ripping apart along the feet as Isaac continued to wear them. I guess he'll be wearing the 3T's that Noah just is growing out of. Yes, he's a big boy. He is convinced that he can do anything that Noah can do. The other day, Noah was using scissors so of course Isaac started cutting too. It turns out that one-year-olds can use scissors, but it's only under very close supervision. I'm sure that Noah never used scissors when he was still one, but then he didn't have an older brother to keep up with. In the picture below, Isaac had decided that he was finished sitting in his booster seat, so he was going to eat lunch sitting on a big chair, using a placemat and an open cup (he refused to use sippy cups quite a long time ago). The funny thing was that he insisted that he sit right next to Noah at the end of the table, not on the side where he normally sits. Noah thought the whole thing was hilarious. He's a good big brother. But, Isaac is still just one. He can balance out his new-found conquests with his love of still being a baby. A few days ago at church, Isaac ran into the nursery and shouted "Baby! Id-ee (Isaac)! Baby Id-ee!" and he figured out how to fit his huge body into the bouncy seat. 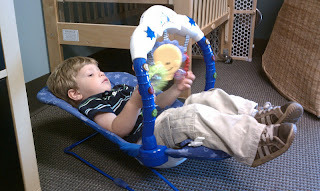 He relaxed there for at least 5 minutes while he bounced and played with the baby toys. It's still fun to be a baby too.